Please don't say that to my Girl Scout! Five things not to say to Girl Scouts. This past weekend, we sold Girl Scout cookies at our local grocery store. I know I’ve been talking about Girl Scouts lately, but it’s cookie season, and it really consumes all of our family. 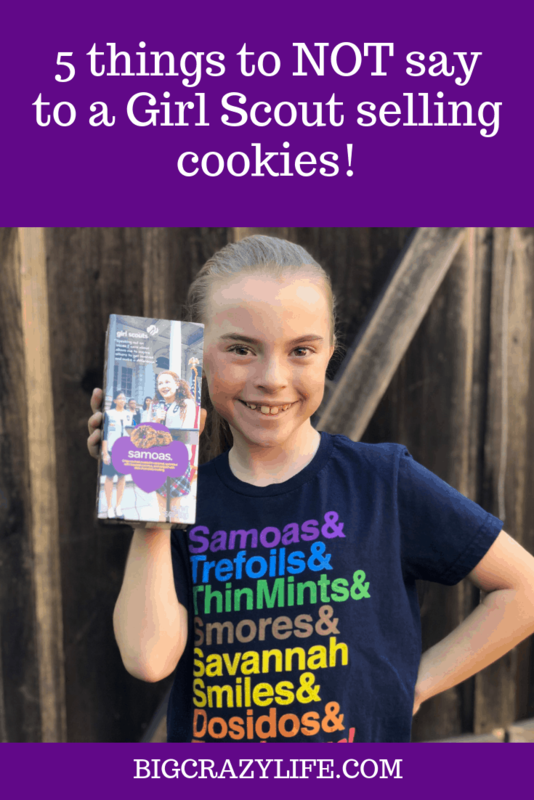 I am the cookie mom for 3 troops, plus I have a daughter who wants to sell at least 1,000 boxes. I’ve been doing this for five years, you’d think that I’ve seen it all by now. This year is different. People are different. Women are… very different. Here are five things not to say to a Girl Scout selling cookies, and a simple suggestion for what you could say instead. I really don’t know why you want your picture taken with my five-year-old, but honestly, it’s kind of creepy. We’ve taught our girls about stranger danger and by you asking to have your picture taken with my daughter, it’s now weird and contradicts everything I’ve been teaching her. She is working hard to reach her goal and this is a real business. Please, just don’t come into their workplace because you think they’re cute, and make things awkward for all of us. Unless you mean it, and follow through. Do NOT tell the girls you’ll be right back, and then take a detour of avoidance on the way out. They are waiting for you to come back, and contrary to what you might think, they can remember you, even your backside. If you don’t plan on buying cookies, just simply say, “No, thank you” and leave it at that. Be an adult. That’s great, I wish I could cut down on sugar too. Maybe after cookie season… But please don’t lecture the girls on how harmful sugar is. Even if you or a family member is a diabetic. This is not your job to teach our girls, it’s ours. Most of us don’t eat a lot of sugar, but a lot of us like an occasional box of Thin Mints during the season. Also? You can totally donate to the troop’s cause, and there’s no sugar for you in a donation! Ignoring a Girl Scout completely. Ok, deep breath here. Do NOT. DO NOT. DON’T under ANY circumstance tell our little girls that you can not buy a box of cookies because you are on a diet, OR you need to lose weight, OR you’re watching your weight, OR you’ve already eaten way too many cookies as you grab your belly. Don’t do it. I shouldn’t even have to tell you why, but here I go… As you stop and look at the cookies (wearing your running gear and you are already rail thin) shifting from one foot to the next, PLEASE just say “No, thank you.” Our girls are so impressionable. And they’re already dealing with so many other pressures on a daily basis. This is the last thing they need to hear about diets and weight issues from another adult. I had to explain to my child what a diet was, and why someone who was already so skinny needed to “watch their weight”. I’m doing my best on a daily basis, which is not easy. Please don’t make this about your own weight issues. I get that there are legitimate reasons to stay away from things like Girl Scout Cookies. But a brief encounter with a Girl Scout who is trying to sell cookies is not the place to bring up this subject. “No, thank you.” We’ll thank you for it. And a sincere thanks for supporting the Girl Scouts. Ok 5. Is creepy AF, 4 and 2 are rude. But 3 and 1? Sorry but why can’t a person say they are trying to control their weight or sugar intake without it offending you? They aren’t saying your Girl Scouts are fat. They are saying they are making a personal choice not to indulge. Your Girl Scouts should wish the luck and be done with it. It’s not personal. OMG yes! Just say “no” or “no, thanks” we don’t need your life story, we’re working! I’ve been a troop leader for 11 years and was a Girl in Scouts before that. I’ve seen it all!! It’s amazing how people act. I don’t understand. “Oh my God! They’re like ISIS.” Was the terrible comment that we received in a mall. My nine year old spouted off that we support girls and don’t kill people by cutting off their heads. We had to start watching news behind closed doors at our house.